Yesterday, Brian Pasch posted a great article with the first examples of a new live Google product called Google Cars – Google’s entry into the 3rd party lead provider business for car dealers. Other than all the obvious tactics that other third-party lead providers employ to maximize revenue from a consumer lead (as illustrated by Brian), I did some digging and found another component of their program that I thought was very interesting. The only way Google could have a dealer’s inventory is via the dealer feeding it to them. If you’re a dealer sending your inventory to Google, be advised that Google is telling consumers that if they find the exact car they’re looking for (down to the specific VIN) in YOUR inventory, that a consumer doesn’t have to buy it from you. In my internet sales career, there were many times that myself and a competing dealer were working with the same customer online. One of the things I always had to look at was if the exact car the customer was looking for was available and who had it. There were plenty of occasions where the only convenient place that had the exact car the consumer wanted was my dealership. One of the strongest value propositions I had when quoting and/or trying to convince a customer to do business with me versus my competitor was that I had the car. Since Google doesn’t release the consumer’s information to the dealer, it’s going to be much harder to identify the cases in which my competitor is working the same customer and trying to sell them a car that I have in stock with the intention of dealer trading with me for the vehicle. One has to assume that only dealers providing inventory and/or participating in this program have the “Contact Dealer” button available as not every dealer does (as illustrated in the image below). As you can see in the example above, it appears that dealer C and F are participating in this program while dealer D and E are not based on the existence (or absence) of the “Contact Dealer” button. So, as a consumer, I’m guessing that only inventory from dealer C and F would be available for a consumer to view. However, using Google’s own advice, I now know that since dealer D is closer to me, I could hypothetically buy dealer C’s car from dealer D.
I don’t necessarily want a provider that I am paying telling the consumers I am paying to attract that they can buy MY cars from my competitor. Not only is this new program by Google hijacking dealer’s SEO efforts by making Google Cars the “most relevant” result in searches but the inventory itself is hosted on Google’s own site which could also eliminate the need for a consumer to visit your own website. Google is also considering the vehicle results delivered via search as “Sponsored” versus organic results so now they are also competing with you for your PPC ad placement. It’s going to be pretty difficult for dealer’s to NOT participate in Google Cars. Unlike other third party lead providers who rely on organic result positioning and PPC ads, a dealer can combat this if it has an aggressive SEO strategy. Google, on the other hand, is always going to deliver their program at the top of the search results, right above the first true organic search result. Does anyone truly believe Google is going to bury their income-producing program in search results? On top of this, Google’s recently formed automotive division has been invited to (and spoken at) many of our industry’s educational events in the last year or so giving advice and “assisting” dealers when all along they were preparing to bring to market a product that would compete with those very same dealers for not only their money but also in their search engine marketing strategies. Google is the new Honey Badger. They don’t care. They’ll just take what they want. Dealers are continuously struggling to keep customers happy. Most dealers want their customers to be happy as a happy customer can lead to more sales through word-of-mouth and referrals. CSI scores in both sales and service are essential in many ways to dealerships and can cause a multitude of problems if they’re not up to par. Sometimes dealers are unfairly treated by customers for minor things, however. I came across this video on YouTube quite by accident and was absolutely astounded. I wasn’t searching for that particular dealership nor was I searching their brand or even searching their area. I’m about as far away geographically from the dealership as you could get so I can’t even blame geographical relevance. In fact, I had very broad search terms. This video still showed up on Page 4 of a Google search. “The dealership provides free Wi-Fi internet access to it’s customers, while waiting for their vehicle to be serviced. One problem: It doesn’t work. Watch me walk around nearly the entire dealership, only to get a signal enough to grab a few bits of data, and crap out. There was a point I got a good signal, but it never returned. This YouTuber knows the power of the internet. He’s uploaded over 1,500 videos and has amassed over 2.5 million views. He’s in a dealership that he even agrees on video deserves its 5-star rating and states in the video description that this is the only part of the dealership that is not good yet he feels compelled to make a video complaining about the lack of free wi-fi despite it being advertised in the service waiting area. It’s obvious that he didn’t “mean” any harm but this dealership now shows up ranking high for search terms like “car dealer” and “fail”. In the comments, he follows up TWO YEARS LATER, stating that the wi-fi still didn’t work. Reputation management begins with knowing what’s being said about you. This is completely unfair to the dealership but it’s a perfect example to illustrate the importance of perfection in your customer’s dealership experience as well as the importance of monitoring what people are saying about you online. What would you have done had this video been made about your dealership? 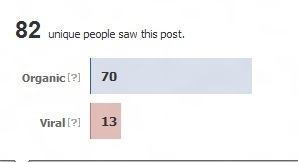 One of the easiest metrics dealers use to judge the success of their Facebook page is how many people like it. It’s also the most irrelevant. You’re better off having 1,000 fans to your page that can actually do business with you than 10,000 fans that will never spend a cent. How do you expect to get ROI from your social media efforts if all your social media fans/followers are in Thailand? (Unless, of course, you have a booming export business to Thailand) The answer is, you won’t. Also, many companies are delivering “fake” fans anyways through shady methods. This article by AllFacebook.com illustrates some of the methods these companies use. Having a lot of Facebook fans that you bought is meaningless and a waste of money. Companies that prey on dealers with a service that increases “likes” to your Facebook page with random people are scam artists. It’s a waste of money and either these companies don’t realize that (which means they are incompetent and shouldn’t be in the social media business) or they do realize that (which means they are intentionally selling a service that has no value). Dealers, please don’t fall into the trap of equating quantity with success. If you build your fan base organically with customers in your market, your social media marketing efforts will bear fruit. Do you want to make money or be able to say “mine is bigger than yours”? You decide. Facebook’s Edgerank algorithm—the formula used to determine the order content appears in a given newsfeed based on which content is deemed most relevant to that user—may make the Facebook experience more seamless for casual browsers, but it’s a challenge for businesses that harness the social media platform as part of a marketing strategy. 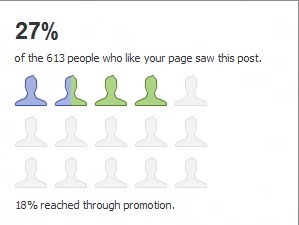 After all, thanks to Edgerank, each post on Facebook only makes it onto the newsfeed of about 12-17% of its fans. The fans that do see it are more likely to be those that have already chosen to visit your page, or that regularly interact with your posts. Edgerank’s feedback-loop effect makes it harder than ever to reach and engage consumers that don’t self-select your business’s content. To counter those daunting odds, Facebook recently introduced a new service allowing business pages with greater than 400 “likes” to pay a fee to promote individual posts. This new feature allows a page owner to select a single post, which could be a status update, photo, video, question, or offer, and pay a premium to increase the reach for that post beyond the circle of fans that are already engaged with your content. Not only that, but promoted posts are supposedly more likely to be seen in the newsfeeds of friends of fans, too. Promoted posts have a one-time, pre-set budget that remains in place for the life of the post. While setting up a promoted post, you will be asked to choose a budget from a suite of options that includes the post’s estimated reach at each payment level. The promotion can be suspended or stopped at any time regardless of whether your maximum budget has been used. Promoted posts do have some targeting capabilities, including geographical location and language, but these can only be applied to posts that are less than three days old. Sounds Great—but Do They Work? 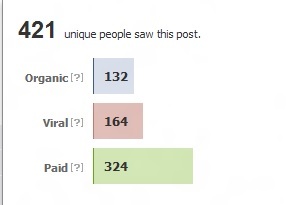 I set out to test the promoted posts feature on my blog’s fan page (which has 613 fans) to see how it performed versus a normal, “organic” post. I’d recently created a page on my blog that consists of a dedicated list of available educational events and conferences for automotive dealers. 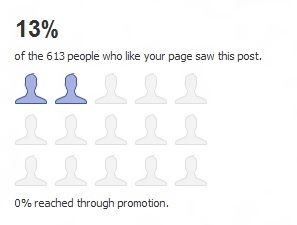 I shared this blog page via a status update on May 23rd, prior to the launch of Promoted Posts. The post performed as expected, reaching roughly 13% of my page’s fans with a marginal viral reach (a measure of how many impressions came from non-fans who encountered the post because a fan of the page shared or interacted with the post). Keep in mind that my Facebook page isn’t particularly active, nor do I put too much effort into engaging my fans, which limits the reach of posts. I mainly use the page to post blog articles, so I don’t expect high engagement, but these statistics are in line with the average reach reported by others. On June 2, I decided to test out the new Promoted Posts feature. Upon creating the new post, the only option presented to me was to pay $5 to reach an estimated 300 people. The post I promoted was essentially the same as the previous one – a status update which included an external link to the same page on my blog. I did no other social media promotion at all for this post and let it run for the full three days. As you can see, the post exceeded the estimated paid reach (with 324 rather than 300 paid impressions), and it also reached 1200% more non-fans (13 vs. 164) via viral sharing, substantially increasing exposure to my fans’ social networks. Organic displays also increased by almost double (70 vs. 132). The promoted post didn’t increase engagement but, the post itself wasn’t really designed to encourage engagement. I also didn’t see a noticeable difference in traffic to the external page on my blog, with the average number of daily visitors to that specific page remaining roughly the same. Two interesting side notes: First, Facebook defines paid results as “the number of people who saw your page post in an Ad or Sponsored Story.” But when signing up for the service, Facebook never mentioned that my promoted post could potentially be displayed via an Ad (on the right of the newsfeed) versus as a Sponsored Story (within the newsfeed itself). In my estimation, Ads constitute weaker exposure than Sponsored Stories, but I have to assume that at least some of the paid exposure for my promoted post came via Ads. Second, as mentioned previously, I was initially only given the option to reach 300 people for $5. However, when I looked into promoting another post following my initial trial, I was given a second option to reach 700 people for $10, as well. This tells me that Facebook underestimated the results they could deliver. Are Promoted Posts for You? As in any form of advertisement, you must have clearly defined goals before spending any money. Here are some questions you should ask yourself before making a decision one way or another regarding promoted posts. 1. How large is your page’s fan base? Keep in mind that the larger your fan base, the more potential reach each promoted post will have, which will result in a higher upfront cost. 2. Are these actual customers, or are they a random assortment of individuals who were collected in an effort to grow the number of fans at all costs? I consider fans to be relevant if they are potential or existing customers who could realistically do business with you—whether that’s via sales, service, or parts—and whose social networks will, in all likelihood, include more relevant people. In the case of dealerships, for example, it does you no good to increase exposure to people outside your PMA, vendors, or anyone else who doesn’t have the ability to spend money with you. Note, however, that the geo-targeting option does allow you to more efficiently reach relevant fans. 3. What is your goal for promoting a particular post? Is it to increase engagement? Increase exposure for an offer or event? Share important information with your fans? Lead people to an external website or conversion page? In my opinion, promoting a post just for the sake of promoting it is ill-advised. If you have clear goals in mind, you should be able to accurately track whether your money was spent wisely. Did you actually increase engagement, and was that engagement by new people rather than those who already regularly engage with you? Did more people take advantage of your offer? Did you receive more traffic (via Facebook) to the external link you included in your post? If you’ve built your fan page organically via your website, in-store signage, or via inclusion in other marketing channels, I could see a promoted post helping to jumpstart your page by potentially increasing your fans via increased exposure to THEIR networks. Keep in mind that the majority of the people you will be reaching already like your page so, in my opinion, the greatest potential of Facebook Promoted Posts is in its ability to extend your exposure beyond your fans and into their social networks. That being said, a well-thought-out promoted post with clearly defined goals has the potential to increase reach and revenues—all at a relatively low cost. I’ve heard many opinions over the years from all perspectives – from vendors who have won them to vendors who have not, from consultants and from dealers. My take is that an award is only meaningful if it is a significant factor in a potential customer’s decision to do business with you. There aren’t a ton of awards for vendors in existence. The ones that do exist are, in most cases, given BY a vendor TO a vendor. I don’t believe that most dealers have knowledge of, or give weight to, industry awards for a simple reason: they’ve never heard of either the award, the awarding “authority”, or both. If so, which ones do you believe have authority and could influence a prospect’s decision-making and why? In my previous article, I covered the dangers of foursquare. While there are probably still many people who don’t use foursquare, this article’s topic is one that most social media users use: photos. We all take pictures and post them to Twitter, Facebook, Flickr, etc. Many people are posting them simply to share with close family and friends while many more (including your kids) are posting them to a larger social network that, many times, doesn’t include people they know. Photos of your children can create a virtual menu for pedophiles. Photos of your “stuff” can attract criminals and make you a target. Photos of you also create opportunities for crimes; especially against women. Photos can also aid in identity theft. Wow, you may be saying. You may also be questioning the veracity of some of my claims. Forgetting the fact that most people don’t use privacy controls on social networks to their full capabilities, there’s one thing many people do not know. Most people who are posting photos to social networks are using their cell phones to take those pictures and post them to their social networks. It’s easy, convenient, most cell phone cameras rival those of dedicated cameras, and many cell phones integrate with social media networks. 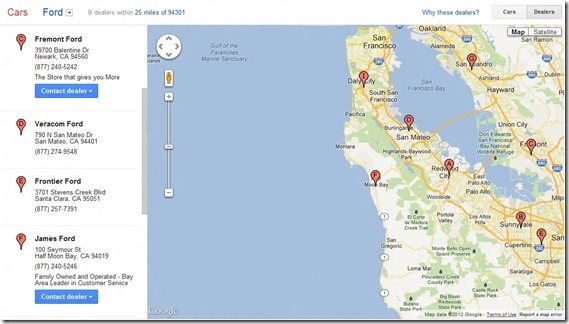 Another feature most cell phones have is GPS functionality including many non-smart phones. When you take a picture from a cell phone that has GPS capabilities, the GPS data for the location the picture was taken is encoded into the file for the picture itself. Yes, it’s there and easily accessible for those who know how. It means that not only are you sharing the content of the photos but also the location the photos were taken at. By sharing photos taken at your home, you are also giving out the EXACT LOCATION of your house down to the exact GPS coordinates. You know those photos of your cool stuff? Yeah, not only do criminals know WHAT you have, they know WHERE it is. Those photos of your children in your house? Yes, you just provided your children’s location as well. Belong to a dating site? That profile picture you uploaded could be contributing where you live along with all the other facts you posted about yourself. Photos shared online create an even higher degree of danger than checking in to foursquare. The more public the social network, the greater the risk you take. Luckily, most camera manufacturers have included the ability to turn off GPS services for the camera functionality. Learn how to turn this feature off. 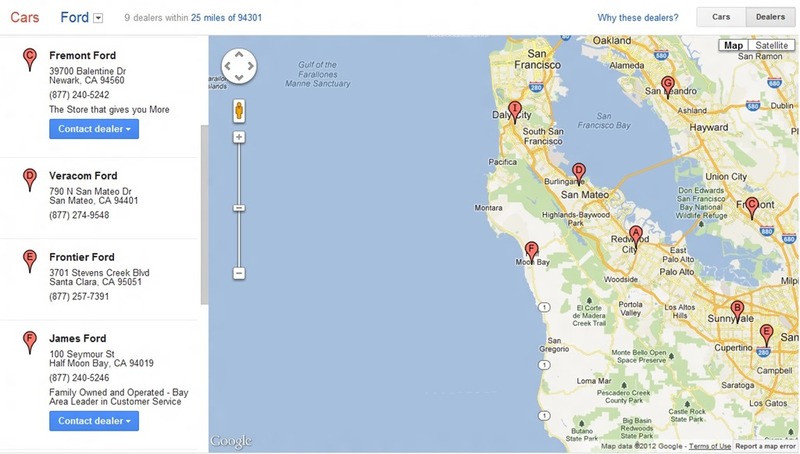 By turning this feature off, you remove GPS data from your pictures and make them a little safer to post. You should still be judicious in what you are sharing but at least you’re not sharing your location anymore.